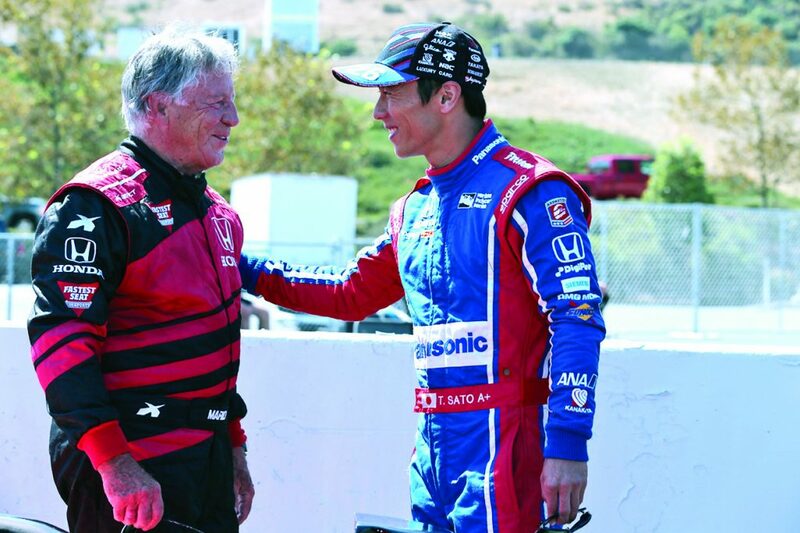 Indy 500 champ Takuma Sato makes history and proves that achieving your dreams doesn’t stop after one try — it’s constantly about pushing onward. If so, then that saying definitely applies to Japan’s Takuma Sato, who raced but never won in seven attempts to win the Indianapolis 500 before finally finishing first with his eighth attempt in May. To do that, he needed to keep at bay Brazilian Helio Castroneves, himself a three-time Indy 500 winner. That victory marked Sato, 40, as the first person of Asian heritage to win the iconic American automobile race, which takes place annually during Memorial Day weekend. With that win, the world is now seeing the fruit borne of Japan’s motor sports culture. Not only did it take eight attempts to finally win, it was, according to Sato, a personal dream that was more than two decades in the making. Sato’s victory in American professional auto racing might be compared to pitcher Hideo Nomo’s impact in Major League Baseball more than 20 years ago, which opened the door to other pro ball players from Japan and elsewhere in Asia, such as Ichiro Suzuki and Hideki Matsui, who competed at that sport’s highest levels and revealed to the world the strength of Japan’s baseball culture. As a teen, Sato was a champion-caliber bicycle racer, and he didn’t actively pursue his dream of becoming a professional race-car driver until he enrolled in the world-famous Suzuka Circuit Racing School right before its cutoff age of 20. Getting in at Suzuka — and earning a scholarship to learn how to become a race-car driver — would change Sato’s life. Asked whether finally achieving the dream of winning the Indy 500 was what he expected, “yes and no” was Sato’s answer. Another one of those events that came with winning was being honored in August with Japan’s Prime Minister Award, presented by Prime Minister Shinzo Abe. It’s an honor bestowed to individuals or organizations that have made societal contributions to Japan. According to Sato, who drove for Andretti Autosport when he won the Indianapolis 500, the racing season is from March to the end of September, and he spends most of that period in the U.S.
“Every week, every two weeks, there is some racing activity,” he said. His U.S. home base is in Indianapolis, Ind., while his wife, Chiharu, stays with their two young children in Japan. Off-season, he spends October through February in Japan, and his family comes to the states to spend time with him during spring and summer break. For now, he says, that system works. Sato nearly won the Indianapolis 500 in 2012 during this third attempt, but crashed when attempting to pass Dario Franchitti, who won that year’s contest. Some things are beyond one’s control, Sato said, and that it’s up to you and your team to prepare for the things you can control — a good-quality, competitive pit crew, your car, etc. Sato should know after competing in eight Indy 500 races, seven of which came up empty for him. “If you look back in history, in most of the cases, you need a few times to attempt the Indy 500 to really understand the depth of how you’re going to race and how you’re going to win in the last part of the race,” he said. Sato noted, however, that last year, his former teammate, Alexander Rossi, won the Indy 500 on his first attempt. Sometimes it happens, he says, but in most cases, you do need to do it a few times. Asked what he thought were the biggest differences between actually driving a race car and what a fan watching from the stands might not know about, Sato said it was probably the physical toll it takes on the body and the actual sensation of speed. He added that the high speeds increase the G-force or equivalent amount of gravity on the body, which at high speeds can equate to five times one’s bodyweight. “Insane” was the word he used for the sensation of speed. “When you have a problem, and you have to park your car on the side of the track, and you’re watching the cars go around the corners, it’s just unbelievable, just staggering,” he said. To keep physically fit for the demands of racing, Sato uses an activity from his teen years — bicycling. “I use a bicycle for some part of my training because you can go out for two or three hours and not get bored. And, there’s something mechanical involved — the wheels, the gears, the brakes that you can adjust — that sort of feeling is very fun,” he said, noting that bicycling also helps with his endurance. As gratifying as the win was for Sato, part of his victory was marred by the reaction from a veteran Denver Post sports writer. After Sato’s win, Terry Frei tweeted: “Nothing specifically personal, but I am very uncomfortable with a Japanese driver winning the Indianapolis 500 during Memorial Day weekend.” Frei would delete the tweet, but not before it was seen by many, including a former Denver Post colleague. Frei used Twitter again to apologize to Sato and his employer — but it was too late. He was out of a job — almost immediately, the Denver Post fired Frei. It was a move that Asakawa disagreed with because a teachable moment was now a lost opportunity. 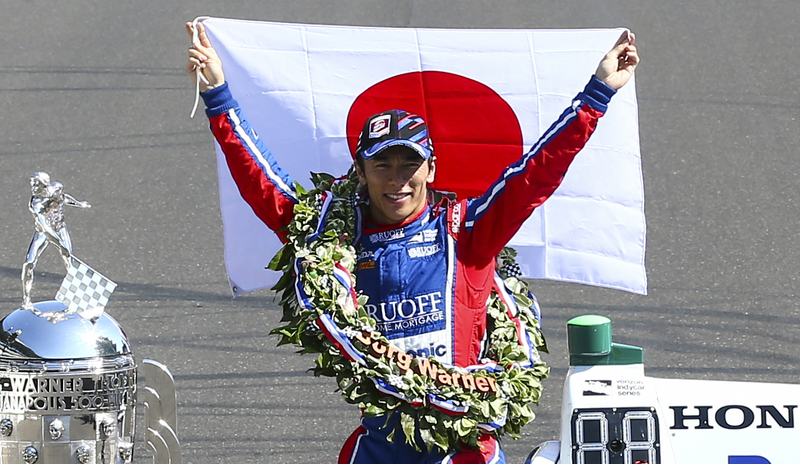 Sato also added: “I feel proud to be from Japan and competing in an international race and winning. So, some people might feel uncomfortable, but, really, nowadays in sports, you can go to the Olympic Games or the World Cup and your nationality shouldn’t restrict you from any competition. For Sato, it is now the off-season, and he is back in Japan to spend time with his family and get a well-deserved respite from the hubbub that came with winning a high-profile car race. In a few months, however, another Indy 500 looms, and Sato has now rejoined Rahal Letterman Lanigan Racing, where he will be teammates with Graham Rahal. Having finally achieved his dream of winning, maybe if preparation and luck realign, he can do it again.